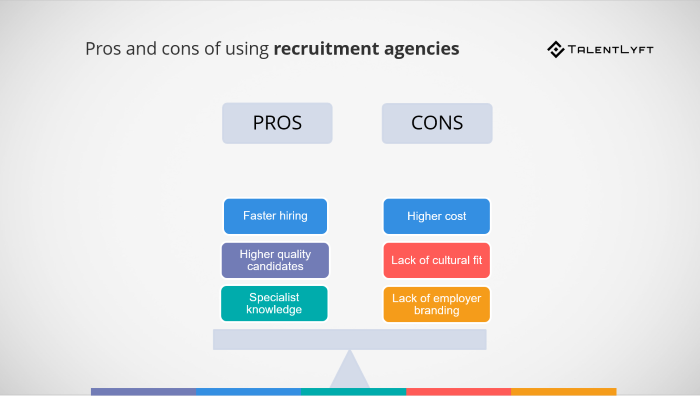 Discover the pros and cons of using a recruitment agency! Using a recruitment agency to help you find and hire the right candidates can be the best - or the worst thing for your company. To make a sensible decision, you should carefully consider both advantages and disadvantages of using a recruitment agency. These days, finding great candidates is hard. Really hard. With unemployment rate lower than ever, it’s a candidate driven market out there. In a situation like this, your best job candidates are passive job seekers - they don't actively look for a job, because they already have one. This means that posting your open job position on job boards is by no means enough to attract the best candidates. You need to formulate a great employee value proposition, craft a job post that will stand out, promote it on various social media and build a perfect career site - all that just to attract candidates and convince them to apply to your open job positions. Once you finally receive applications, you need to spend hours and hours to go through them and find qualified candidates. Doing all that takes time. It is a lot of (hard) work! ➡️ Download our list of the most productive recruitment marketing strategies! If you don’t have a dedicated in-house recruiter, other members of your team will have to suffer under additional recruiting workload. Even if you have a dedicated in-house recruiter, you might not be able to find and reach the type of candidate you need. If you’re in a similar situation, you’re probably considering using the services of a recruitment agency. Recruitment agencies can help you find and shortlist high-quality candidates. However, using a recruitment agency has both advantages and disadvantages. Read on to discover all the pros and cons of using a recruitment agency! Using a recruitment agency will shorten the time needed to fill your open job positions. You won’t have to spend time attracting candidates and going through tons of profiles and applications to find a few qualified ones. A recruitment agency will do all that and deliver only a few top candidates for your consideration. Also, a recruitment agency can usually find candidates much faster than you can. This is because recruitment agencies already have a vast talent network. When using a recruitment agency, you can tap into its large talent pool of already vetted candidates. This will significantly shorten your time to hire! Using a recruitment agency will improve the quality of candidates in your recruitment process. As we already mentioned, recruitment agencies have large talent pool with already pre-screened and pre-referenced candidates. It means that you will only deal with candidates who are carefully assessed and vetted. Besides, recruitment agencies are experts in candidate selection. Agency recruiters are professionally trained to assess candidates. They use the best practice methods to differentiate real experts from good interviewees. They also have a vast experience you can benefit from. Using a recruitment agency will allow you to tap into a specialist knowledge your in-house recruiters might not possess. An in-house recruiter usually has to cover a wide range of different roles a company needs. On the other hand, most recruitment agencies are specialized in recruiting for a certain industry, role or level. It means that they have better knowledge and deeper understanding of their targeted job market segments. As a result, recruitment agencies can provide you with valuable insight and useful advice that can help you find and hire better candidates. Now that we’ve examined the key pros of using a recruitment agency, let’s turn to cons. Of course, using a recruitment agency has some downsides, too. Using a recruitment agency can be a quite expensive endeavor. In general, recruitment agencies’ fees are around 20 to 30% of the employee’s annual salary. The cost of using a recruitment agency can get even higher if you’re looking to make a hire for a hard to fill role. Either way, when using a recruitment agency, you will have to pay a fixed fee every time you want to make a hire. On the other hand, if you’re handling your recruitment process in-house, you can experiment and test your recruitment methods and channels. That way, you can stop wasting money on recruitment methods and channels which don't work for you and invest it into those that yield the highest return on investment. You can also invest your money in building your talent pool for your future hiring needs, thus saving money in the long run. Recruitment agencies can’t ensure the cultural fit of their suggested candidates. Recruitment agencies can deliver the candidates that are the best fit for a certain position and role. However, they are much weaker at assessing a cultural fit. In other words, recruitment agencies can help you choose the best candidate for your open position, but not for your company culture and your team. Best recruitment agencies will go out of their way to become familiar with your company goals, mission, vision and values. However, agency recruiters will never have the same understanding and experience of your company culture as your employees who live and breathe in it every day. If you use recruitment agencies, you miss an opportunity to build your company’s employer branding strategy - and own it. Every step of recruiting process is an opportunity to formulate, present and promote your reputation as an employer of choice. However, if you put your recruiting efforts in a hands of a recruitment agency, you won’t have a full control of your employer brand. Someone else will be presenting and selling your employer brand to your potential candidates. Your potential candidates will create their first impression of your company based on secondhand information - not a direct contact with your company. Conclusion: Should you use a recruitment agency or recruit by yourself? Should you use a recruitment agency to help you find and shortlist the best candidates? Or should you handle the full cycle recruiting process by yourself? Which option is better: In-house or agency recruitment? ✔️ A recruitment agency can help you find high-quality candidates and fill your open positions faster. ❌ However, using a recruitment agency can be expensive. Additionally, a recruitment agency can’t understand your company culture in a way your employees would. This means recruitment agencies can help you find the best people for the job, but they can’t ensure that the selected candidates are a truly great fit for your company culture and your team. Do you have an in-house expertise to handle your hiring needs? Could you benefit from developing it? Do you want to invest in a long-term recruiting strategies or you just need a quick fix? Answering these questions will help you make your final decision about using a recruitment agency. 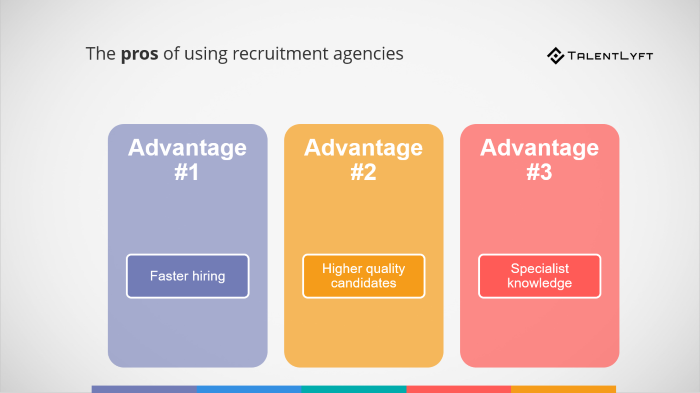 If you decide to go for it, make sure to check out the Ultimate guide for choosing a recruitment agency.